SoftDetective™ is a software utility that you can use to monitor other programs running on your computer and see the changes they make to your files, folders, and the registry settings. 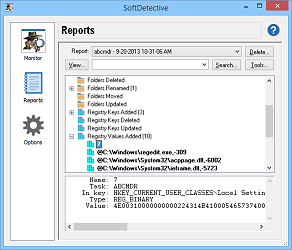 If you suspect that some software is doing something that it shouldn't, you can use SoftDetective to examine the activity of the program and see exactly what it is doing to your PC. You can use SoftDetective to monitor the installations of other programs, to see which files they are installing on your computer, and what kind of changes they make to the registry settings. SoftDetective can also observe the changes made during the removal of other programs, letting you see whether the uninstall procedure removes all its files properly or leaves something behind. See the files and folders that are created, modified, renamed, or deleted by a specific program. See the differences in their sizes, the time stamps, the file names, and even the portions of the text files that were modified. See the changes that the program you have selected to monitor has made to Windows Registry: which registry keys it's added, deleted, or updated, and see exactly what has changed. You can select to launch the programs to monitor them from the very beginning, or observe the already running processes. You can also monitor the uninstall activity of the previously installed applications. If a program being monitored deletes a file, SoftDetective saves the original copy in a temporary folder, letting you examine that copy or restore it back, if you want. If a program being monitored modifies a text file, SoftDetective saves the original copy in a temporary folder, letting you can examine both the original and the updated versions and even use a third-party diff viewer to analyze the changes in detail. In addition to seeing the activity reports on the computer screen, you can also export them into the text or HTML files and print them out. Is this software compatible with Windows 10? Yes, SoftDetective is fully compatible with Windows 10, as well as with Windows 8, 7, Vista, and Windows XP. (Both the 32- and 64-bit version of Windows are supported.) Keep in mind, however, that it's a desktop application, so it cannot be used with the Windows RT computers. SoftDetective is available to the licensed business customers of our password-protection software Folder Guard, free of charge. If you have purchased a professional or office license for Folder Guard, you can download SoftDetective after entering your Folder Guard license key. If you have not purchased a Folder Guard business license yet, you can purchase it now.